This is a continuation of my series summarizing and examining the claims of Devine and Stephen’s Discontinuous Syntax: Hyperbaton in Greek. Part three is the longest post I’ve written thus far, though much of it consists of examples from the New Testament. For part I, see HERE and for part II, see HERE. The previous discussion worked off the assumption that Y1 hyperbaton encoded focus. Chapter two of DS seeks to examine that assumption in order to provide a more detail account of the phenomenon. Beginning with a discussion of types of focus, DS then move on to examine the function of the Y­1 modifier and the Y­2 Noun in hyperbaton and their relationship to focus before concluding with some theoretical perspectives on accounting for these discontinuous phrases for Classical Greek. They also implement a couple of tests for proving the narrow scope of focus only on the modifier in Y1 Hyperbaton. Discontinuous Syntax delineates two general types of focus: Weak Focus and Strong Focus. The latter also has a sub type, which they refer to as Contrastive Focus. Any of these types of focus can be either broad, covering an entire phrase or narrow, covering only a subconstituent of a phrase, such as an adjective. (1) Who was on the phone? JOHN was on the phone. The answer, “John,” provides new, unknown information. It fills a gap in the knowledge of the person asking the question. The information focus in such answers necessarily involves choosing between alternatives. These alternatives are basically the presuppositional knowledge of the one asking the question. Someone was the on the phone and the person to whom the question asks likely knows specifically. This kind of weak focus is particularly important in texts or discourses where the questions are implicit rather than explicit as above. Consider example (2). Speaker B: I use LOEB for authors like Pindar. Speaker B’s response to A functions as the answer to an implicit question, as if A asked, “What do you do for reading difficult authors such as Pindar?” In cases such as this, Focus structure functions so as to encode various implicit questions in a discourse. But example (21) also shows us that weak focus makes no claim about its completeness or exclusiveness. There may well be other (and perhaps better) ways of dealing with challenging Greek authors. Weak focus simply provides one possibility among many. Strong Focus takes things a step further by either implicitly or explicitly evoking the same sort of possibilities or alternatives as weak focus, but at the same time chooses one and negates the others. In English, strong focus is marked by intonational emphasis on a particular word or phrase. Let us look back at example (2) now repeated as (3). What if the person asking the question had been waiting for a call specifically from Dave and that the person answering the question had just hung up the phone. (3) Who was on the phone? Now when the interlocutor receives the answer, not only is the basic information received that John was on the other end of the phone, but the answer also both evokes and negates the other possibility – that Dave was on the phone. But in (3), the evocation and negation of the other possibility is only implicit based on the general context rather than an explicit statement. This is where the subcategory of Contrastive Focus comes into play. Contrastive Focus is also strong focus, but makes the negatives of alternatives directly explicit. This is seen in (4). (4) Mike studies GREEK, but his wife prefers Latin. In this case the alternative that Mike studies Latin is negated explicitly by means of the contrast with his wife. Contrastive focus tends to be more clearly recognized than implicit strong focus. After a probably too brief summary Focus, we are not better equipped to examine the pragmatics of Y1 Hyperbaton according DS and test their claims in Koine Greek texts. Previously, we saw that strong focus evokes and negates a set of alternatives. In this section we will examine how that plays out with different types of modifiers, including quantifiers (both negative and positive), demonstratives, adjectives of size, numbers, comparatives and superlatives, and other restrictive adjectives. Descriptive adjectives are rare or non-occurring in Classical Greek according to DS. Thus far, this has been proven true for Koine as well. The article never appears in Hyperbaton by itself, not even as an archaic demonstrative. Adjectives of size or dimension negate their opposite. Cardinal numbers exclude other possibilities. Comparatives and Superlatives exclude either the greater or lower points on the scale of comparison. But now Jesus has obtained a more excellent ministry as much as he is a better mediator of the Covenant. Heb 8:6. Example (15) is particularly interesting. It has the Y1 Hyperbaton structure twice in a row. Jesus’ ministry is more excellent (not less) and for that reason, he is a better (not worse) mediator than any other priest. When we search for restrictive adjectives, we find examples like (16-17). Giving him a severe flogging Acts 16:23 (not a light one). This exclusion of alternates in Y1­ Hyperbaton does not seem to be a mere side effect of restrictive or specification properties of adjectives with weak. The speaker or author is not just conveying his belief about the audience being misinformed or unaware. He is instead making a deliberate point about the modifier in the Y­­1 position. It is the modifier rather than its opposites that applies to the head noun. The hyperbaton structure is used, whether consciously or unconsciously, to ensure the audience is fully aware the alternatives are excluded. The structure’s appearance in texts like Hebrew and 2 Peter confirms this. While this section does not appear in DS, it does provide a fruitful analysis for examining the effects of strong focus in Y1 Hyperbaton. 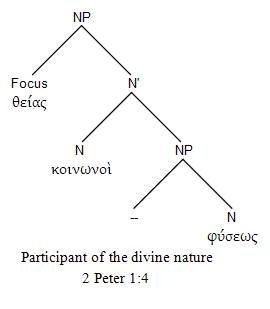 As just mentioned, the appearance of this structure in texts such as Hebrews and 2 Peter seems to confirm the relationship between strong focus and hyperbaton. The this section examines these two texts from this perspective. The “Letter” to the Hebrews’ main point is that Jesus has the superior priesthood to the exclusion of all alternatives. Paul Ellingworth writes these words about the purpose of Hebrews, “Christ as high priest, offering in perfect obedience to the Father the sacrifice of himself, accomplished once for all what the old priesthood and its animal sacrifices foreshadowed but could not effect.” And what do we find when we look at the text, Y1 Hyperbaton appears in Hebrew at least 18 times. And the majority of those instances either refer to Christ directly or function in the warning passages against falling away from the faith. But we must also consider 2 Peter, which Richard Bauckham describes as “a polemical document.” And he continues saying, “Its purpose is to counter the influence of a group of teachers in the churches to which it is addressed, and to this end it employs not only denunciation but also apologetic argument in defense of the eschatological teaching of the apostles against their objections.” And in 2 Peter’s short three chapters, there are five instances of Y1 Hyperbaton. This is significant when compared with the rest of the New Testament. 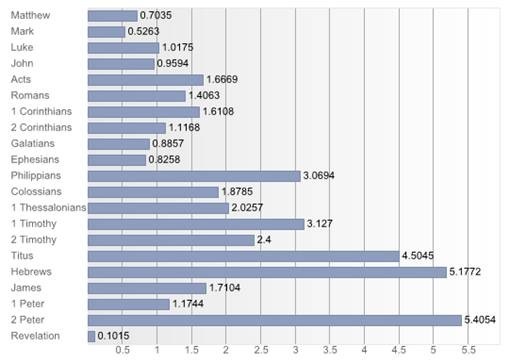 Figure 4 shows how many occurrences of Y1­ Hyperbaton appear in the 27 books in the New Testament per every 1000 words in the book. Figure 4 shows that Y1 Hyperbaton is more common in 2 Peter than any other book of the New Testament with Hebrew following as a close second. Since there are only five occurrences, it would be worth it to examine all five of them. They are seen in examples (18-21). To those who have received a faith as precious as ours through the righteousness of our God and Savior Jesus Christ (2 Peter 1:1). From the very first verse, we see that 2 Peter is a polemic letter. If Y1 Hyperbaton encodes strong focus, then it follows that the author is making it very clear who his audience is: those who have received a precious and valuable faith. The implication is that those false teachers, advancing views of “eschatological skepticism,” and those who follow them have a worthless faith. First of all you must understand this, that in the last days scoffers will come, scoffing and indulging their own lusts 4 and saying, “Where is the promise of his coming? For ever since our ancestors died,﻿﻿ all things continue as they were from the beginning of creation!” 5 They deliberately ignore this fact, that by the word of God heavens existed long ago and an earth was formed out of water and by means of water, 6 through which the world of that time was deluged with water and perished. If these words about skeptics in the last days also apply to the false teachers about which Peter rights, then he has every reason to emphasize the greatness and preciousness of God’s promises. …so that through them you may escape from the corruption that is in the world because of lust, and may become participants of the divine nature (1:4b). Thus far, this is the only instances of a descriptive adjective appearing in Y1 Hyperbaton. But the strong focus is still quite clear. This is not the first letter. Peter has been forced by these false teachers to write multiple letters. By making this point, he emphasizes the seriousness of the situation. The basic structural claim regarding this type of discontinuous phrase is essentially the same as provided in chapter one of DS. They consider the XP of their Y1 XP Y2 order to be the maximal phrase projection for this type of hyperbaton. Graphically, DS’s structure is in the following figure. Because DS assume a linguistic theory that uses movement to explain different structure configurations and their functional information, they leave an empty branch in the Genitive NP at the lowest level. A non-transformational theory of syntax would model this phenomenon differently. For example, Lexical Functional Grammar, which represents Functional information separately from constituent order, would provide the following structures for Y1 Hyperbaton, seen in figure 6. The matrix beside the tree diagram represents the functional information of the clause and allows the same word to fill multiple functions in the phrase. Thus, θείας is both the Adjective modifying φύσεως and also the focus on the phrase as a whole, avoiding the issue of movement altogether. The phrase structure rule that would license this tree is below. A number of conclusions can be drawn from the above discussion. DS state three important conclusions rather succinctly. If we assume that DS is correct in saying that Y1 Hyperbaton is not a meaningless construction then a significant number of commentaries have missed and/or ignored some rather important structural facets of Koine texts, including those of the New Testament. We have seen above that Y1 Hyperbaton place a role in both Hebrews and 2 Peter and it is not uncommon in Paul’s letters either. The fact that its less common in other NT texts does not mean that those authors did not use strong focus. As DS state, Y1 isoptional. Thus it is possible either for the pragmatic meaning to exist without the syntax encoding it in this manner or for the text in general to avoid this kind of strong foci. With that said, there is still more to be done in terms of testing the claims of DS more precisely than has been attempted here. Implementing these tests for Koine texts is too time consuming for them to practical for our purposes here. All definitions in this section of those of DS, though this summary makes no claims about being exhaustive on the subject of Focus, which is a much more complex topic than presented here even in DS. Section 2.1 condenses a 13 page discussion into 2 pages. Examining such implicit questions marked by this kind of focus would be a worthwhile task in New Testament texts, but beyond our scope presently. It might be helpful to point out once again that Y1 Hyperbaton is defined as a discontinuous phrase where the Modifier appears in the initial position: Y1 XP Y2. In Y2 Hyperbaton, which is not the subject here, the modifier appears in the second position of the discontinuous phrase. Of the couple hundred instances I’ve examined, I have only found one example of a descriptive in Y1 hyperbaton. See below on 2 Peter 3:1. Interestingly, this is the only demonstrative used in Y1 Hyperbaton. See also John 12:37; 1 Cor 14:10; Heb 2:3; 12:3; 13:16. Paul Ellingworth, The Epistle to the Hebrews: A Commentary on the Greek Text (NIGTC; Grand Rapids, Mich.; Eerdmans, 1993), 80. Heb 1:4; 2:3; 4:7; 4:11; 6:11; 7:11; 8:1, 6, 7; 9:4-5, 28; 10:2, 12, 29; 11:38; 12:3. Richard J. Bauckham, 2 Peter, Jude (WBC 50; Dallas: Word, 2002), 154. The translation in these examples is the NRSV. It should also be noted that Opentext.org recognizes conjoined adjectives in the Y1­ position as two instances of Hyperbaton. Thus the first two hits in 2 Peter 1:4 are treated together. And the third hit in 1:4 is treated separately. And also Baulkham’s reconstruction described above. I’ve modified the NRSV here. Even more Functional Theories, such as Role and Reference Grammar or Functional Discourse Grammar would appear would both appear different than either DS’s representation or the LFG representation above. Information structure attributes such as TOPIC, FOCUS, BACKGROUND INFORMATION, and COMPLETIVE INFORMATION are more recently represented in a separate “Information Structure Matrix” in LFG, rather than in the Functional Structure Matrix. This is a relatively recent innovation in the theory, since the example above is only a single noun phrase, it seems more convenient to use an F-Structure. Were we to look at a larger section of discourse, an I-Structure matrix would be more appropriate. There also could be morphosyntactic information provided for the adjective θείας as well. It is not provide for space considerations. Interesting. This will certainly help me to understand NT Greek better. I wonder if Y1 hyperbaton could be related to the phenomenon of putting certain conjunctions in the second place in a sentence. At least with MEN…DE we see constituents in strong focus shifted out of their natural position to before the conjunction. Perhaps originally by some kind of analogy adjectives in strong focus were shifted to before the preceding constituent, to increase their prominence. I have one more post to put up related to chapter 2, which should provide a more objective foundation for the conclusions. Had I included them initially, I wouldn’t have gotten this post up for another week. Thanks, Mike. When I mentioned strong focus in connection with δε, I was thinking primarily of cases where it follows μεν, giving explicit contrasted and excluding focus. But very likely there is often if not always some kind of focus involved in how δε works. Peter, actually in DS, they actually use μεν for more objectively testing whether hyperbaton encodes focus. I haven’t had time to search for clauses that have by hyperbaton and μεν, but I did just post about μονος and και, two of the other words they used for testing. Of course one difference with μεν and δε is that they commonly occur between the article and the noun, as in Ephesians 4:11. I don’t suppose you would class this as a form of hyperbaton. Yes, I’ve separated all of the postpositive conjunctions and particple like those from my search hits.